Self expression is important to us humans. We want out space to reflect who we are, be practical and make us feel at home. Today’s bathrooms are hardly just a place to attend to one’s body’s needs but more a relaxation area where you can treat yourself with a warm bath after a long day at work. Fortunately, thanks to innovations in bathroom flooring industry the balance between usability and looks is easily achievable. The most of the flooring products currently available on the market do a great job at enduring the harsh treatment we put out bathrooms through every day. They can tolerate constant water splashes, take on hard chemical spills and fight off spotting while not having to sacrifice the gorgeous look. To help you decide what floor to choose for your bathroom, we are offering an overview of the most popular options. Stone is just as popular as it was centuries ago. The latest bathroom trends have it cover not only the floor but also the walls, giving the entire room a simple and timeless look. Natural stone is famous for its durability and variety. Stone flooring generally comes in two forms, polished or unpolished. Polished stone floor is a beautiful addition to any bathroom but it tends to be slippery and should be used with extra care in families with young children or elderly.As an alternative to polished stone flooring honed and textured stone floors offer a better grip, but because of their raw surface, they may require a sealant to prevent stains. Typically, stone floors come pre-cut in 12 inches square or larger tiles and require a strong subfloor for installation. Unlike soft floors, stone tends to be cold to touch. If you aren’t much for wearing slippers, you might want to consider alternative flooring options for your bathroom. Vinyl is definitely this decade’s favourite flooring product. The days of cheap sheets with a laughable likeness to wood and stone are long gone. Luxury vinyl flooring offers all the advantages of a manmade product and is hardly distinguishable from any natural material. Vinyl floors are hard wearing, water resistant and can be installed over underfloor heating. Because of their foamy feel, they are a lot nicer to walk on than stone type floors. There are two kinds of vinyl floors, tiles and sheets. Sheet vinyl comes in rolls that are 6- or 12-feet wide, providing a seamless look. Vinyl tiles, on the other hand, are typically 12 to 18 inches square and are easier to install – a great advantage for those who would like to install the floor themselves. Vinyl tiles as well as sheets are available in wood and stone effect, as well as a number or exciting, dynamic patterns. Many people think that choosing a wooden floor for a potentially waterlogged space is far from reasonable. However, the contrary is true. With engineered hardwood flooring and it’s improved properties over the solid wood floor, water splashes seem less than an inconvenience. The cross layered structure of engineered wood makes each plank 80% better at resisting water than a solid hardwood board. Floors made out of engineered hardwood are stable and less likely to shift under humid conditions than plain wood floors. They also tend to be a more appropriate option than laminate since the later has a tendency to swell and cup if the water gets through the seams. Even engineered hardwood with its enhanced water resistance needs right care to live up to its promise. Leaving wet bath mats and towels on the floor or not drying off water straight away can worsen your floor’s look and even shorten its life. Because of this It is not really recommended for families with younger children who may be less attentive when it comes to cleaning up spillages. If wooden look is something you desperately want for your bathroom, there are plenty of alternatives that mimic wood texture and pattern perfectly. Rubber flooring is perfect for families with younger members who are looking for a floor that can take on any challenge. Rubber is durable, easy to clean and can endure constant water splashes. It’s soft and pleasant to walk on, even barefoot. The textured finish prevents slips. Although should those still happen, the fall will be softened by the rubber which also happens to be a great shock absorbent. 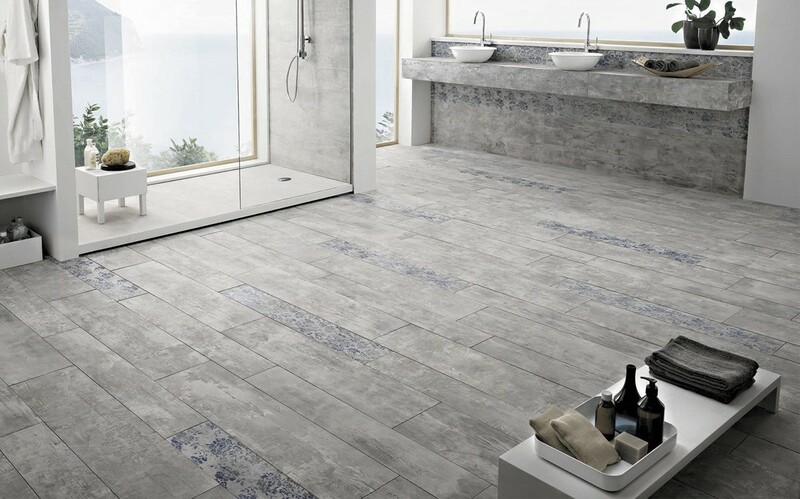 Available in pretty much any colour, pattern or texture it’s a design-savvy choice for bathroom flooring.